ARTHUR CAYLEY autograph letter Signed. British mathematician. One of the founders of the modern science of pure mathematics. ALS. 1p. 2 stone Buildings WC. 31st January 1863. To W[alter] White, Assistant Secretary to the Royal Society. 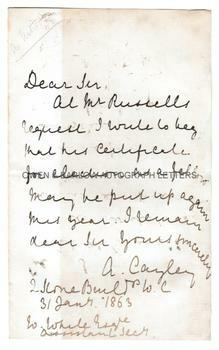 "At Mr Russell's request, I write to beg that his certificate for election as a fellow may be put up again next year. I remain, dear Sir, yours sincerely, A. Cayley." 8vo. Approx 7.25 x 4.5 inches (18.5 x 11.5 cms). Blank leaf of bifolium excised to a stub which has previously been used for mounting. Mounting traces to verso, else near fine. Arthur Cayley made many important contributions to the science of mathematics, including pioneering work in algebraic geometry and group theory. 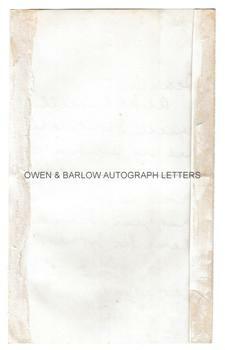 Autograph letters of Arthur Cayley are uncommon.